Located on 35th Street between Seventh and Eighth Avenues, The Renaissance New York Midtown is the city’s first “living” hotel and features ambient intelligent corridors that respond to human movement, digitally enhanced elevator banks, and a never-before-seen Discovery Portal powered by Time Out that showcases hyper-local neighborhood guides on a user-friendly digital alcove to be accessed with the point of a finger or tap of a foot. A four-story LED digital clock at the top of the building also brings the hotel to life adding a beacon of light to the city’s skyline for all to enjoy. 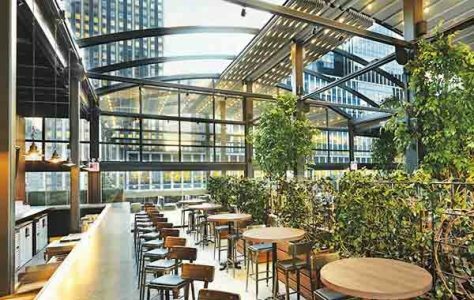 Topping off the 388-room property is a Rock and Reilly’s gourmet gastropub, on the fifth floor, featuring an 8,000 square-foot outdoor terrace, a rarity in New York City, with a retractable roof, private cabanas, comfortable seating and two fully-stocked bars. To read more at Travel Daily News, click here.